I hope you’ll join me live tonight at 9pm ET / 6pm PT for the party and an interactive Tips Tuesday recap and breaking news discussion on the BlogAid Facebook Page. You can also catch the quick recap later that evening on the BlogAid YouTube Channel. Now that the new theme design is complete, over the weekend I finished deleting about 40 old pages and all their images from BlogAid. And I finished up the content revamp, all of which is live on the site now, at least for pages. Then I migrated the site to a sandbox and put the new theme on it so I could practice the changeover. I’ve got my notes all ready and we just have a couple of little tweaks to make. So, I’m pretty sure I’ll be launching the new design later this week. I’m also collecting up more quotes from happy clients for all the services and classes I offer, as I’ll be featuring them more prominently all over the revamped site. There are several on there now, but I need to do a way better job of making sure everyone sees them. That’s especially true of my clients who have doubled, tripled, and even quadrupled their income, plus ranked well on Google and have tons more traffic now. So, if you’re my client for anything, look for an invitation I sent on Sunday to all BlogAid News subscribers and share your happy story. I’m blown away by some of the ones I’ve already received. Things like a 4000% increase in traffic. I’m not kidding, she sent me her Google Analytics graph. I can’t wait to share these success stories with you on the new site soon too!! Well, I didn’t think I’d be sharing this update with you for a few weeks. As you may recall, last week I reported that the house deal fell through and I’d be taking off a couple of weeks to work at my desk. Providence and the Universe had other plans. I found another house in the hottest area of town and they accepted my contract. So, everything is in motion and I’ll keep you posted. I’m diving head first into Gutenberg over the next couple of weeks too. We expect WP 4.9.8 to roll out at the end of the month and it will have a nag to try the Gutenberg plugin. We’re going to turn that off. And then we are expecting Gutenberg to roll into the WP core, meaning no plugin required, with the release of 5.0 sometime in August. I’ll have a tour for you of what the Gutenberg text editor looks like and whether you want to use it now or not. One of the critically important things to keep in mind with all of this is that Gutenberg is a complete revolution of the WordPress CMS, or Content Management System. What’s coming in 5.0 is just the text editor part, which is only one piece of the whole new thing. And that’s the main reason I’ve cautioned the majority of site owners all along to skip making use of it for about another year until we have fully compliant Gutenberg themes and plugins to replace all of the functionality you have now with no conflicts and no hoohaa. You’ll see why when I do that overview post and you get a good look at all the text editor can do at this time, and what it can’t do, and why you likely don’t want to mix and match between old and new. During my recent site audits I’ve seen lots of folks still on unsupported versions of PHP. That’s the coding language WP and plugins and themes are written on. Our PHP level at the host is not something we’ve had to think about until the last couple of years. It’s critically important that you upgrade to at least 7.0 now. WP and plugins are dropping support for any version lower than that. In site audits, I’m seeing more and more plugins throwing errors in the PHP error log because of this. And the worst of it will be you updating a plugin that has dropped support and you get the white screen of death. That’s definitely something you don’t want to have to deal with under duress and at an inconvenient time. READ: How and Why to Switch to PHP 7 and make the switch a priority on your to do list this week. Is Your Backup Solution Complete? With all the massive changes happening to sites right now, it’s critically important that you check your last safety net, which is your backup solution, and ensure it’s up to par. This is the single most important piece of your whole site security system. You want to ensure that you are getting everything you need in that backup. So, you can’t get away with an incomplete backup system that you don’t know how to restore these days. My top 2 recommendations are the paid version of UpdraftPlus with storage on Amazon S3 for small to medium sized sites, and then VaultPress for large sites, with you manually downloading those 2 files outside WP at least once or twice a year, so they are current. I’ve got a post for you to read about the differences in the free and paid versions of UpdraftPlus. And, they’ve just updated their interface too. I’ll be updating my tutorials in the Webmaster Training courses for that in the coming month. I want to give them a chance to settle down with more tweaks first. I had yanked VaultPress off my recommended list because it now requires you to install JetPack, which I’m no fan of either. But there is a trick after you get VaultPress connected where you can uninstall JetPack. And I’ll say one last thing about backups. If you’re counting on the one your host takes, you’re on super thin ice. Read the fine print on that, even if you’re paying extra for it. It’s not guaranteed. You need your own backup that is stored off the hosting. Here ‘tis! Google has been issuing Not Secure warnings for different site situations for nearly two years. And they told us in early 2018 that HTTPS would be required for all sites soon. The latest Chrome browser, version 68, will show a Not Secure warning in the URL bar for any site that is not HTTPS, regardless of whether they collect any data on the site or not. If you have not converted, or you have used some host or plugin trickery, contact me and let’s get that straightened out for you. Holy cow, y’all!! My fave SEO agency, Stone Temple Consulting, has been acquired by Perficient. So, what does all of this mean for the amazing SEO info on research and trends that Stone Temple makes so freely available to us? The Perficient press release hit on July 16, and that’s the last Here’s Why post on Stone Temple. So, I guess we’ll see. Voice Search: What Will the Future Bring? Wow, this is an interesting take on what the future of Voice Search holds. Joost de Valk (of Yoast SEO) is addicted to using voice for talking to his machines. His wife is a much more reluctant adopter. And in this post, she interviews him about it, and compares their different takes on it. And foodie bloggers, this post is a must-read for you, to get Joost’s take on how he uses voice search while cooking. Marilyn is #1 in Voice Search!!!!!! 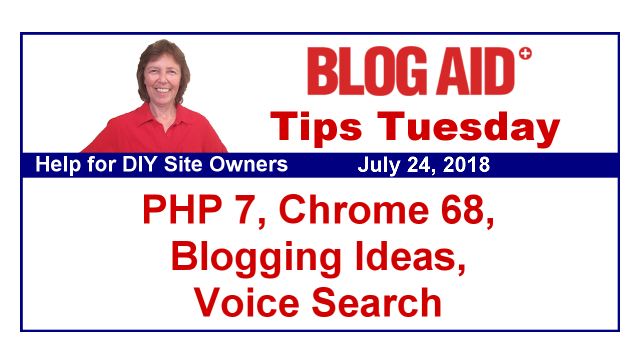 And I want to take a minute to congratulate Marilyn Lesniak of Marilyn’s Treats for getting one of her posts ranked #1 on Voice Search and regular search this week too. One of the reasons I’ve maintained that using the Content Analysis tool in the Yoast SEO plugin does more harm than good is that it makes you focus on a single keyword, or maybe two, but always just that word. SEO has not worked that way since 2013. It’s all about AI now (Artificial Intelligence). The last thing you want to do is keep using the same word over and over. Synonyms work better for readers and SEO. It just sounds more natural. So, I’m thrilled to see this long overdue update to the Yoast SEO plugin in version 7.8 to allow for synonym analysis too. I seriously doubt it is as powerful as Google’s AI, but it’s a step in the right direction. Keep in mind that the on-page tool is an okay thing for beginner bloggers. But do NOT strive for that green dot all the time. Most of my posts that hit the top of Google only have a yellow dot at best. Many actually have a red dot. And I bet that is true for others in my DIY SEO course who are also getting into Featured Snippets and such too. This post may be a little techie for site owners, but I think it’s a good idea for you to scan it so you get a real dose of just how many security vulnerabilities your site is exposed to. The really good news is, the WAF (Web Application Firewall) on the Cloudflare Pro plan protects you from all of these top 10 security vulnerabilities identified by the OWASP folks. Plus, it now protects you from the 2 most common security issues that crop up in WP plugins all the time. If you’re on the free Cloudflare plan, you definitely want to consider upgrading to the Pro plan so you can get this WAF. For me, $20/mo is cheap peace of mind!!! And I have some site audit clients who can testify that a WAF saved them from a hack too. When you do upgrade, holler at me for a quick live session to turn on the WAF and check settings. I’d like to be a fly on the wall of the support department at SiteGround when the backlash of this thing hits. It’s going to be a mess for folks who migrate from an EIG owned host, especially Bluehost and Hostgator. When you change hosts, you also change hosting environments. EIG owned hosts are still in the dark ages with their setup and all the dangerous files they have in your site. SiteGround is a modern host. When you move yourself, using this tool, all hell is going to break loose. Of course, you won’t know that until after you point your domain to the new host. Same thing is going to happen if you have Wordfence running. Plus none of the files outside WP are moved, like the .htaccess and robots.txt and such I mentioned earlier. And, if your email runs through the host, you can forget those too, plus any redirects or such that you may have set up in cPanel. Got add-on domains? They won’t come over either. What a mess this is going to be. I know because I project manage these moves for my site audit clients. Ask any of them how much hoohaa there is to it. READ: How to Migrate Your Site to a New Host for more on what’s involved these days. SiteGround is doing everything they can to be the non-techie site owner hosting choice. And while I appreciate that, they are not doing site owners any real favors, like with their server-side caching and HTTPS trickery, and being in the middle of your WP updates. And then some things, like this, are just a bad idea. If you’re in a narrow niche, you may feel like you’re writing about the same ‘ole stuff all the time and it can be a struggle to get fresh ideas for new posts. If you’re in that rut, this post on Blogging Pro will really help. It’s got 7 great tips for things you can do now that will jump start your creative juices. I do #3 all the time, which is ask your readers. I just ask my clients. In fact, I’ve had some super duper live conversations with a few of them lately, and sure ‘nough, I’ve got new ideas for BlogAid, and new tutorial posts and such. I’m also planning to do #5 soon, which is re-reading my most popular posts. During this recent content revamp, I updated all of my important pages and deleted a whole bunch that no longer serve. For the rest of the year I’ll be doing that with my posts. And I have a good start on a new Helpful Posts page so you can easily find the tips and tutorials you need. Plus, I’ve started a renewed promo campaign for them. I’m already adding to them a little at the time. So, do go scan the Blogging Pro post for 5 more excellent tips that will help get you writing fresh again. Thanks, as always, MaAnna. I mentioned your SEO course in my recent Summer Bucket List Update #1, and got a nice comment about you from GiGi Eats. Thank you so much for the mention on the DIY SEO course, Christie!! And GiGi is about the funnest person on the planet. Have you seen the videos when her husband joins in? They are a hoot!! I just recently discovered GiGi’s blog, so I haven’t watched many, but the one I did was hilarious! Thank you MaAnna for the kind shout out about my post. My head is still reeling. I am confident it got there because I followed every single tutorial and suggestion you have on SEO. And then updating to the new schema, synonyms, and the video skyrocketed the recipe. I will be writing my experiences with BlogAid tonight. Congratulations Marilyn! Besides your own blogging success, you are always so helpful whenever I have questions. Thank you. Without you and Dee, I wouldn’t have found MaAnna. Woohoo Marilyn!!! I’m so thrilled for you!!!! So much to learn!! And how thankful I am that you’re here to teach it MaAnna!! I might need to do a new “site lingo” post and another about what you need to have done on your site these days to be up to par. Thinking that might be a new optin.